Millie Garfield of Swampscott began posting a blog more than three years ago, and it has completely changed her life. 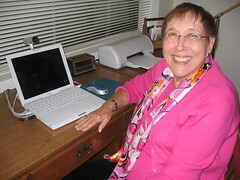 As a result of her computer-related activities, the 81-year-old now has friends around the world, and was invited to appear on Ellen DeGeneres’s television talk show. Contrary to the popular maxim, one can teach an old dog new tricks. Take Millie Garfield, for example. Four years ago, she knew nothing about computer blogs or bytes. Today, the 81-year-old maintains an Internet site visited by hundreds of faithful fans interested in hearing her humorous musings on life. 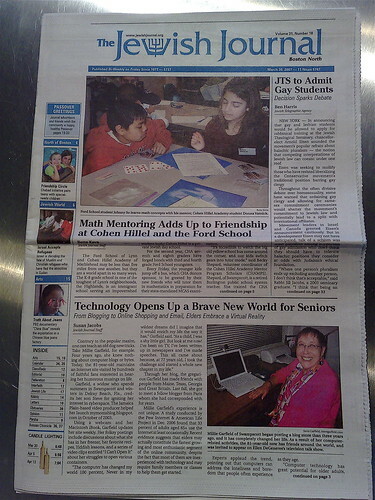 Garfield, a widow who spends summers in Swampscott and winters in Delray Beach, Fla., credits her son Steve for igniting her interest in cyberspace. The Jamaica Plain-based video producer helped her launch mymomsblog.blogspot.com in October of 2003. Using a webcam and her Macintosh iBook, Garfield updates her site weekly. Her folksy postings include discussions about what she has in her freezer, her favorite recipes, Yiddish lessons, and a series of video clips entitled “I Can’t Open It” about her struggles to open various containers. Through her blog, the gregarious Garfield has made friends with people from Maine, Texas, Georgia and Great Britain. Last fall, she got to meet a fellow blogger from Paris whom she had corresponded with for years. This is probably going to be one of my last posts from sunny Florida and I've been trying to think of something funny to write about. --- I finally thought about something that happened many years ago when my husband and I first started going down to Florida for the winter. At that time, we were staying in a one bedroom condo on the second floor. My husband was a very light sleeper and was being disturbed by some birds that would start their "song" very early in the morning. It was driving him nuts!! Well you know how it goes, a woman has a problem and she talks about it, a man has a problem and he finds a solution. At that time there was no such thing as a Walmart or Target but there was a store where you could buy just about anything. you name it, they had it. Off we went "looking for something." Now that I look back, I think he know what he was looking for. "A VERY LARGE SQIURT GUN." As I remember it now, we bumped into friends that we knew and when they saw what Aaron was buying, they said, "What the heck are you going to do with that?" When we got back to our condo he filled the gun with water and out he went to spray and frighten the birds. They were never heard from again!! But, that's not the end of the story. The downstairs neighbor had just had her sofa cleaned and didn't like the odor from the chemicals that had been used, SO she put the sofa on her patio to air out. She got more then she bargained for, her sofa not only got aired out, it got sprayed too! Fortunately it didn't harm the sofa. I guess you could say my husband's idea was "all wet." "Millie — now an 81-year-old who splits her time between Kings Point in Delray Beach and Swampscott, Mass. — takes it with such grace. The world has been reading her since October 2003, when Steve Garfield, got her blogging at www.mymomsblog.blogspot.com. Not long after, she started video blogging (also with her son's help) in a series called 'I Can't Open It.' Ten episodes have featured her grappling with various containers, then brightening when her son opens them for her. 'At the age of 77, I started blogging,' she wrote in a recent posting. 'Never in my wildest dreams did I imagine that it would enrich my life the way it has." In just about a month I will be closing up shop here and heading back north. When I get settled in Florida it's time to get together with friends for lunch. or dinner and say "Hello." Now it's time to get together for lunch or dinner and say "Good Bye." That entails a lot of eating out, in many cases it means taking home "doggie bags." That works out fine when I arrive but it's an altogether different story when the date of departure gets close. 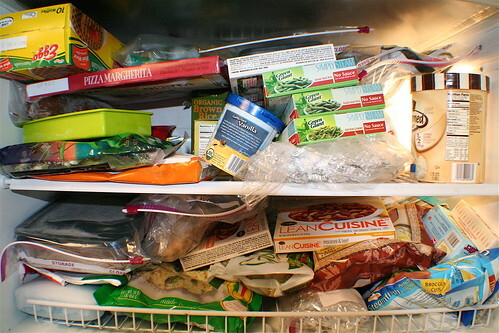 I just took a look in my freezer and I have so much stuff in there! I can't possibly eat everything I have in there in a months time. Now you might say, "well why don't you give some of that food to someone who stays longer then you do." Aha, that's a good thought but most everyone I know down here is a snowbird and they go home about the same time I do. The acceleration of doggie bags is growing and not only that but a friend of mine is bringing me bagel! Why oh why is she doing that? I'll tell you! She has a neighbor who works in a deli and the policy of the place is at the end of the day they either throw out the bagel or give them to the help, .Well, this good natured person brings home the bagel and gives them to her neighbors. My friend's freezer is loaded, needed help, so she brought me a large assortment of bagel. I usually buy plain, egg or whole wheat bagel, now, you name it I have it! I know the solution to this problem is not to go out to eat so much and eat home more - that's not going to happen!! I have this problem every season and somehow it works out, by the time I leave my freezer is empty!! Mission accomplished! On February 10, I made a post entitled "My Life Saver" in which I related my problems with Capital One, who's TJX Visa plan had come to an end. I recently received a letter from TJX informing me that I will be receiving information on the new TJX Rewards program with a new bank soon! Until then they are offering me a temporary savings card good for 10% off every purchase at their stores from now through April 15, 2007. I didn't waste anytime and have already taken advantage of their offer! The new TJX Reward card with a new bank will offer 10% off my first in-store purchase and $10 in rewards for every $200 I spend at any of their stores! "You are a valued customer, and we apologize for any inconvenience during our transition and hope you will enjoy this special discount." Now that's a good company to do business with! Good bye to Capital One and Hello to TJX! !